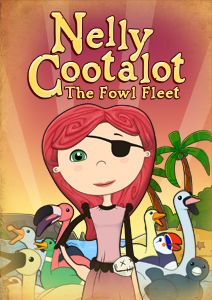 Alasdair created a first adventure game called "Nelly Cootalot - Spoonbeaks Ahoy" in 2008 as a birthday present for his girlfriend. It is not part one. It is a different adventure built in a much simpler style with a shorter story and has been released as a free game on the Adventure Game Studio site. In 2013 he ran a successful Kickstarter and got in touch with Application Systems Heidelberg (ASH). In 2014 Alasdair and ASH agreed to make the game even bigger and better and started to port it from AGS to Unity, allowing for HD graphics way more animations and other improvements. Quickly the budget of the game grew to a six digit number. Unfortunately the Kickstarter money was only enough to pay for the Voice Over in one language. Meanwhile 47 people have been paid for their contribution to Nelly.